As more adults compete with teens and students for summer jobs, you need all the help you can get. Knowing this can open your eyes to options you haven't already thought about. In other words, if you're NOT a teenager, student or graduate, most summer jobs will probably not be relevant to your career unless you want to test a new direction or you work in a seasonal industry. That said, you can use a summer job as a way to get your foot in the door of a targeted company, and then impress the employer into hiring you full-time. Now let's take a look at what's so special about summer job hunting. Entertainment and tourism-oriented businesses do better in the summer as people go on vacation, everyone knows that, right? Yet there are lots of other industries that boom in the summer too for less obvious reasons. Read on for ideas below. Many summer jobs require little to no experience. To save time and money, many employers will hire the first reputable (read: trustworthy) candidates that apply. Many summer job openings are already filled by April, but with all that time until the jobs actually begin, things can come up and plans can change. Candidates may decide they prefer other jobs or not to work at all, and employers may realize they need more help than anticipated. Many summer jobs, such as at fast-food restaurants or retail stores, will want you to submit an application form instead of a resume (which many teens might not have anyway). Spend the time to complete any forms correctly. If the form needs to be filled in by hand, take a few copies in case you make a mistake you can't correct. Like with a resume, have someone reliable proofread your applications before you submit them. If you read my summer job history, you'll notice that during 3 different summers, I worked more than one job. That was never planned in advance – although it could have been – but if you keep your eyes and ears open and stay ready, you can quickly jump to a better job or just another one if your first one ends early. 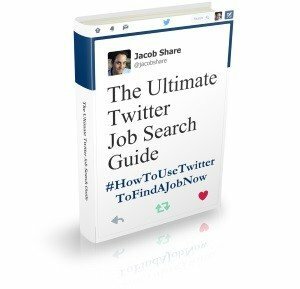 Are there are any job search tactics you've been too shy to try on your long-term career job search? Give them a shot during the summer when there's less at stake. You'll learn what works for you and what doesn't, and build more confidence for when you really need it. If you're a teenager or student, aim for jobs where having a flexible schedule is important, or dealing with other teenagers and students. If you're an adult, aim for jobs where employers will feel more comfortable by your experience, or where you'll need to work with people who might be uncomfortable dealing with teenagers and students. … you can clearly make money immediately, or you won't need to. Summer is short and if you try the wrong idea, you might waste the whole summer without any returns for your efforts. DO start your own business during the summer if you're not desperate for cash right way and are hoping to time things so that earnings will arrive after the summer when you'll need them more. 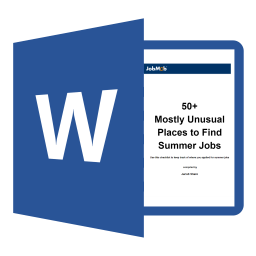 Make this your last summer job search by impressing your employer so much they'll want you to come back next summer. 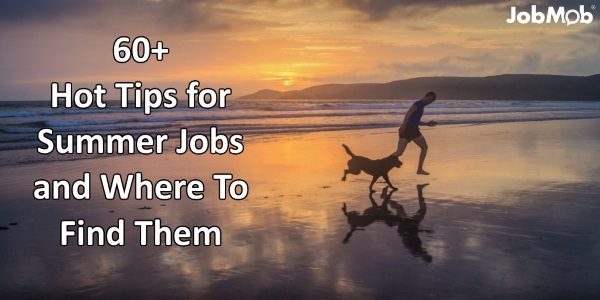 With those tips in mind, here are lots of ideas where to look for summer jobs. 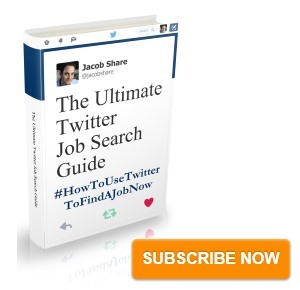 Subscribe to JobMob via RSS or email and follow me on Twitter for more summer job search help. Great post – and very timely! I’m in the process of developing an online coaching programme for job-hunters and career-changers, and one of the things I recommend in it is that they find a “practice job”, so that they can have a field trip into a potential new career. Many of these great ideas will apply, so I’ll be sharing this…. Ace the interview for first time job-hunters with no real prior work experience. Employers are looking for three things: Will you be on time when scheduled? Will you be disciplined to follow instructions? and Will you be a good team mate? Take what you learned from your parents, school and sports to properly answer the questions. Your teenager will get the job while other will moan that they have no experience and can’t get a job. This post makes me happy that I decided to take the summer to spend time with my kids. The fact is that when you’re competing with students, you’re competing for student salaries and showing other employers how little you’ll work for!